Kyoto Tenseian, Kyoto, Japan. Photo: Gunjan Virk. Image©www.thingstodot.com. A fifteen minute walk from the city center near the famous Kiyomizu Temple, in a quiet street corner of Kyoto, is Kyoto Tenseian-a ryokan styled guest house of potter Takushi Haraguchi. The space comprises of a first floor Japanese-style room, a western-style room, a study room, a small kitchenette and private bathroom. A washing machine in the balcony is also provided. The pottery workshop of Haraguchi San is located on the ground floor. The cost of the entire accommodation varies from 10,000 yen-18,000 yen per night for two to four people. Haraguchi San's pottery studio, Kyoto, Japan. I stayed at Haraguchi San's place for the two nights I was in Kyoto. From Kyoto railway station, I took a taxi to the guest house that cost me about 1200 yen. Taxi drivers in Kyoto usually don't speak any English, and after unsuccessfully trying to communicate to the driver in sign language that he should speak to Haraguchi San on the phone for the correct location of the house, I just shrugged my shoulders and laid back on the passenger seat, hoping that he would bring me to the right place! Fortunately, we arrived at the guest house within a few minutes! Haraguchi San was quick to help me unload my luggage and bring it up to his apartment, my home for the next two days. The place was simple and clean, and I looked forward to my first night sleeping on a tatami mat, a traditional Japanese floor covering that insulates earth currents and helps in sleeping deeply. After showing me around, Haraguchi San sat me down and very carefully drew me a map of the surrounding areas and the places to visit. The ryokan is located in close walking distance to some of Kyoto's famous temples and shrines like the Kiyomizu Temple and the Yasaka Shrine. The Gion district is also very close. There is also a metro station in walking distance. 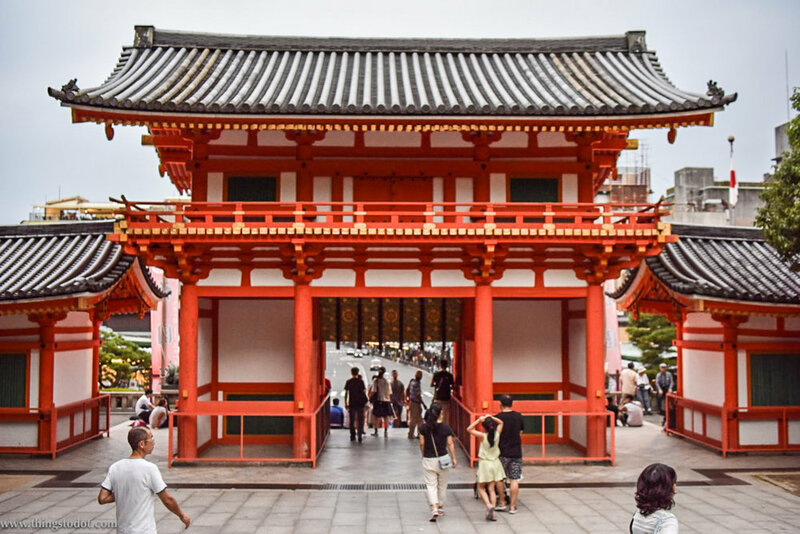 Even though I was very exhausted from my day's journey, after I settled in, I could not resist picking up my camera and walking to the Yasaka Shrine where the famous Gion Matsuri festival was concluding that evening. 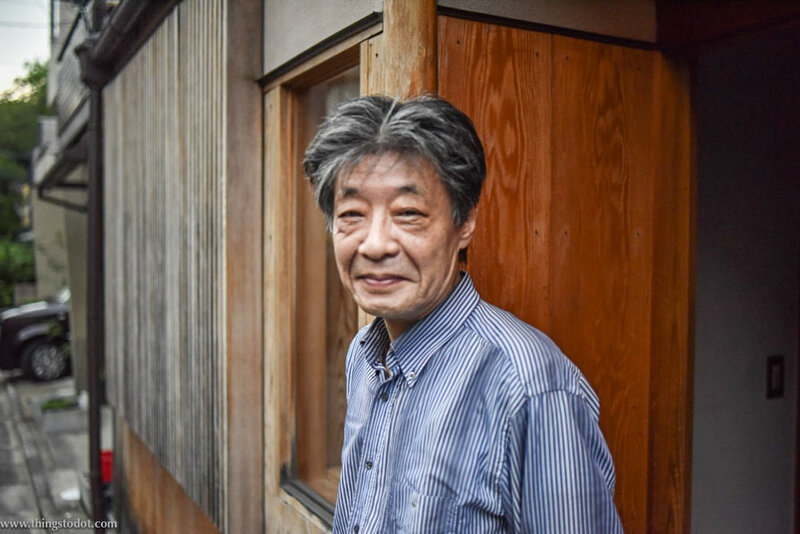 Haraguchi San is a wonderful English speaking host who lives a few homes away from the ryokan and can be contacted at any time by his guests. For reservations, contact Haraguchi San by email at info@tenseian.com. You can also visit his website https://www.tenseian.com. This is not a sponsored post. Yasaka Shrine, Kyoto, Japan. Photo: Gunjan Virk. Image©www.thingstodot.com.